Empty by Suzanne Weyn. (Grades 7 and up.) Scholastic Press, October 2010. 182 pages? * Reviewed from ARC provided by publisher. Fossil fuels are running out. No, not in decades. Not in years. NOW. As countries declare their oil reserves to be empty, the price of oil (and along with it, gasoline, electricity, food, plastic products, and pretty much everything else) is skyrocketing. Only the super rich can afford to drive anywhere or keep the air conditioning on. When tragedy strikes, three teens from very different backgrounds, will have to figure out what it takes to survive. And if they can survive in a world that is empty, they just might find some hope for the future. The premise of this book is AWESOME. I can't remember where I first head about it (maybe the Scholastic librarian preview? ), but ever since then I've had it on my TBR list and I've been crossing my fingers that Scholastic would send me an ARC (thank you!!). It's right up my alley - speculative fiction, a threat that could very well be real, apocalyptic-ness = all things that are awesome! And I will say that I actually learned some things (they use oil products to make shampoo and toothpaste?!) and I definitely think that teens will learn some things from this book. Fossil fuels, energy conservation, and global warming are all hot topics right now, that's for sure, and the book definitely predicts dire consequences if we don't change our ways. I can definitely see classroom applications. Reading Empty might add to a science discussion about global warming, for instance. However, I couldn't get over the stock characters and the unrealistic dialog. Seriously, some parts of the book read just like a textbook on fossil fuels. I appreciate that the author needed to get this information across to readers (and actually, the informative-ness of the book is one of its strengths, in my opinion), but the way the info is included just didn't feel organic. Outside of the classroom, I think this'll have limited appeal to teens. To me, it reads like a novel that was written for the express purpose of teaching teens about fossil fuels and what might happen if we don't change our ways. That said, every book's got its audience, and I would try it out on teens who are interested in this issue and/or teens who have enjoyed other current-events-inspired disaster novels like maybe The Carbon Diaries 2015 by Saci Lloyd or Streams of Babel by Carol Plum-Ucci. A note on the cover: I love the cover of this book and I find it very appealing. It definitely made me want to pick up the book, but I wonder about its teen appeal. Any teens reading want to weigh in? Does this cover make you want to pick up the book? Or is it only us old fogeys who won't stop talking about gas prices? 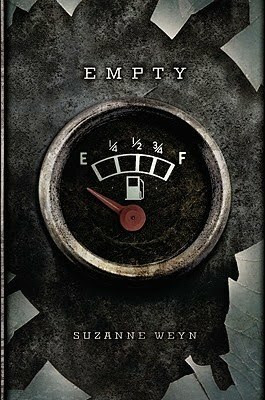 Empty will be on shelves October 1. *The ARC I have is 182 pages. Good Reads and Amazon say it's 256 pages. So... yeah.